My first goal of 2013 is to cultivate joy. In my last blog post, I wrote that in order to cultivate joy, I would “do things which me bring me joy. Embrace the random. Enjoy the mediocre. Don’t stress over things I can’t control. Live in the moment and revel in those I spend my time with. Put down my phone or my other distractions and really love and live the moment.” For me those are the beginning steps to cultivating what I perceive to be pure joy. Because I am not the most joyful person, I decided to learn from what others have written about joy. What is joy? How does joy work? Is joy the same thing as happiness? Is joy what some mystics call ecstasy? Is joy something that one must experience every day in order to be considered joyful? I suppose I had (maybe still have) many, many questions about a theological, psychological, and behavioral characteristic I claim I am going to cultivate this year. I intentionally used the word cultivate for what I intend to do with joy. There are really three types of cultivation. One type is more like refinement, which would require that I already possess some amount of joy that I simply plan to nurture and shape into much more mature, refined joy. This is not the type of cultivation I will be accomplishing. I will be using a combination of the second two types of cultivation: improving by the care or study of joy and fostering the growth of joy. Much like a farmer cultivates crops in a field or a scientist cultivates specimens in petri dishes, I plan to plant, encourage, maintain, and harvest this joy. I plan to do the backbreaking work of starting from the ground up, digging little holes, planting little joy seeds, growing little joy plants, and then harvesting whatever little joy flowers or fruits grow from those plants. This is a whole new endeavor, and I didn’t even buy crop insurance. I’m not sure this is the sort of thing that can be insured. I’ll either come away with a bouquet of flowers or a peck of fruits from this year of cultivation, or I won’t. The pursuit of joy is mostly up to me and my willingness to work for it. Sounds weird: work for, cultivate joy. Similarly, much like I have studied for the past few years to cultivate my knowledge of literature, I hope to study to cultivate my understanding of joy. I started by reading four articles, which is of course where I would start with this damn rational mind I’ve been given, but I plan to pay more attention to those people in my life who seem to be joyful. How is it that they can experience joy, when there is so much sadness, so much angst, and so much depravity in this world? Do they maintain certain habits? Do they hold certain attitudes? Do they rely on their spiritual lives, whatever religion or non-religion they may be? How do they seem to be so filled with joy? Naturally, I first turned to John Wesley for thoughts about joy. Not because he was necessarily a joy-filled man, but precisely because he strove toward joy and sometimes fell short, did I turn to Wesley for wise words about the topic. In the article titled “John Wesley’s Moral Pneumatology: The Fruits of the Spirit as Theological Virtues,” Joseph William Cunningham writes: “The cultivation of spiritual virtue is abstract from community. Believers develop the holy tempers of righteousness, love and peace in relation to their neighbour. The fruits of the Spirit, though inward dispositions of the soul, are always socially oriented” (284). When I read these lines, I had three thoughts. First, I was elated that he used the word cultivated because that’s my word! (:)) Second, I was thrilled that he used the virtue, because when I was writing my goals for this year, I had in the back of my mind Ben Franklin’s thirteen virtues. Third, all theological concepts work best, and are meant to work best, when practiced in community. We are not designed to be solitary beings. 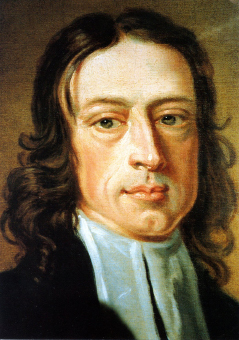 This photo was taken from http://anglicanhistory.org/wesley/. On a more serious note, I really was elated when I saw these lines, but it was more because it has always seemed that joy is an inwardly focused theological concept; joy is about how I feel, right? The above quote made me think of the many ways in which joy is much more outwardly focused. Though Cunningham doesn’t list joy here in this passage, I can’t help but think joy comes in community, that joy is an “inward disposition” that should be “socially oriented.” I’ve experienced joy in my life, and usually that joy was felt in community. I have been in love, which was joyful. I have won competitions, which was joyful. I have experienced God, which was joyful. I’ve sung spirituals and released my pain and suffering, which was joyful. In every situation, while I was the person experiencing the joy, there were others experiencing it with me. I am not sure I have ever experienced joy alone. And if I have, my first inclination was likely to share that joy. One reason I may not be the most joyful person is that I abhor those shiny, happy Christians I grew up with. Seriously, you can’t possibly be that happy all the time. Joyful? Maybe. Shiny happy? I doubt it. I was thrilled when I was reminded that Wesley struggled with the concept of continuous joy. Later in the same article, Cunningham quotes Wesley: “A will steadily and uniformly devoted to God is essential to a state of sanctification, but not an uniformity of joy or peace or happy communion with God. They may rise and fall in various degrees; nay an may be affected either by the body or by diabolical agency, in a manner which all our wisdom can never understand or present” (285). In other words, all of those people who told me I had to be happy to show my Christian faith were wrong. My will has been constantly (or nearly so) devoted to God. Only the outward signs of the fruit of the spirit have wavered. We, in this lifetime, cannot be filled with “love, joy, peace, patience, kindness, goodness, faithfulness,gentleness and self-control” (Galatians 5:22-23). We are human, yes? Perfection is something to be attained. My quest for an understanding of joy was likely fueled by reading An Unquenchable Thirst. Much like the author Mary Johnson, I fell in love with Mother Teresa when I was young. A drawing of Mother Teresa with the words Living Saints in large, bold letters graced the cover of time magazine when I was about 18 months old. There is no way that image could have impacted me like it did Johnson, but I grew up having a knowledge of saints (likely from my mom’s Orthodox family) and having a certain reverence for Mother Teresa. I read everything I could about her, and I believed I had been a nun in a former life (okay, really I still believe it). There is simply something that appeals to me about living with other women whose thoughts are directed toward God and others; there is something that strikes a chord within me when I think about regulating my day with service and prayer. I have always thought that I might experience more joy in a place that was filled with Christ’s love. 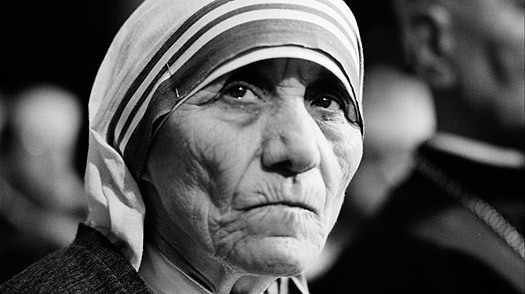 This photo was taken from http://topics.time.com/mother-teresa/. When I read Johnson’s book, I learned what I knew deep down: sometimes things aren’t what they seem. I had always assumed, until the August 2007 Time Magazine article, that Mother Teresa was the most joyful woman on earth, and if I believed what Cunningham writes about Wesley’s thoughts of joy she might be: “Joy is a theological virtue implying habitual self-sacrifice and service of neighbour, even in the midst of sorrow and despair. The desire to love and serve is animated by true joy in the Spirit, and cultivated through commitment and practice” (286). Half-heartedly I agree with this. Before I read Johnson’s story, I (maybe) would have whole-heartedly agreed with it. Joy seems to be fed by giving to others, but I worry, now, if giving everything to others renders us not joyful but broken. Theologically, I suppose that very brokenness is where some folks would say that God works when we can’t. You know, the “Jesus works through our brokenness” idea? I am not sure I can buy that line of reasoning anymore, not the brokenness reasoning, but the idea that if we sacrifice and serve, we’ll be joyful. In fact, Wesley himself writes: “Yet it cannot be denied that many times joy is withheld even from them that walk uprightly” (Cunningham 286). Does pouring one’s whole self out into others and loving and serving provide joy? Yes, but not always. No, but sometimes. Maybe. So, here I am at the end of my first consideration of the cultivation of joy, and I have studied and learned what one person thinks about joy. After thinking about how to cultivate joy, do I feel more joyful? Not yet, but I am hopeful.